the user experience of an indoor kitchen outside. Modulare 01 has no reason to fear the passing of time or even the most adverse weather agents, thanks to the absence of weld joints, its watertight drawers, stainless steel frame, and essential, timeless design. Modulare 01, with its 2 7.4KW burners and gas grill, is the ideal companion for grilling food. Pair it with the induction hob to create a complete, versatile, and safe cooking system. 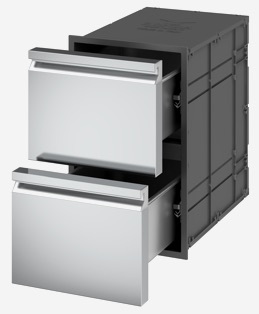 Each module is equipped with the revolutionary ROK cell, which consists of watertight containers and a magnetic-close drawer, thereby allowing you to keep your hot and cold food at a constant temperature and protect it from external agents. And it’s not just about cooking… A real cooking station requires a sink too. This professional stainless steel sink with a pull out spray mixer tap transforms your cooking station into a multi-purpose work area. Once closed, the induction hob and grill covers become a practical stainless steel worktop designed and tested to last over the years. a start module, a middle module, and an end module. 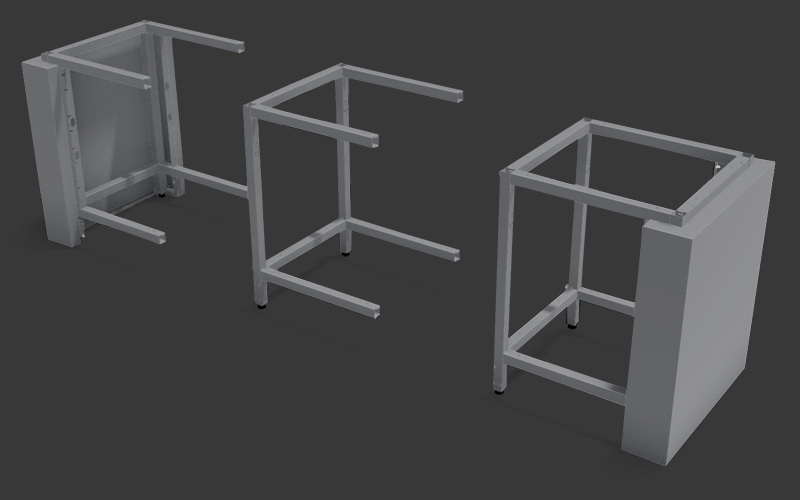 easy to assemble, thanks to patented ROK joint. allowing for absolute freedom in layout and composition. A non-toxic metal, stainless steel, conforms to all current laws relating to materials to be used for food preparation purposes. Stainless steel is a metal alloy which combines the excellent mechanical properties typical of steel with the non-corrosive qualities of noble metals. This stunning wood has been prized since ancient times on account of its malleability and unmistakeable perfume. While steel is the choice your head makes, cedarwood will win over your heart thanks to its warm colour and velvety soft texture. Used to create sculptures and decorate sumptuous villas for centuries, it was the favourite stone of the Vicenza-born genius Andrea Palladio. Thanks to its warm, neutral tones, Vicenza Stone works well in any environment, whether classic or modern.